Santa, his reindeer, Frosty and all their friends want you to use our templates. We offer free Christmas letterhead templates for your business or personal use. The templates pictured to the left are two samples of the 12 templates offered below. Some templates have a background watermark. If you don't want the watermark, click Page Layout from the menu, then click the Watermark button and the Remove Watermark option. Select from four designs and a variety of color options of our free business letterhead. Customize the letterhead and enjoy. If more traditional letterhead templates are what you are after, we have those too; we have some sample letterhead designs. Click here for more letterhead templates. 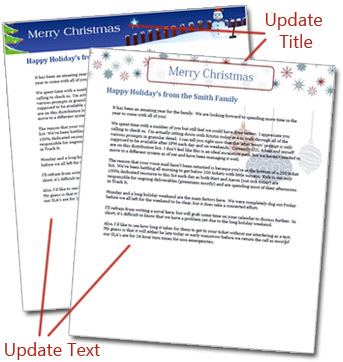 Note: Please be patient while downloading our Christmas templates, as the file sizes are large. Step 2 - Tell Someone! Making life a little easier with our free Letterhead Templates!